Among the by-products of Princeton’s consolidation last January was the merger of municipal offices from two buildings into one. The new arrangement, which moved departments located at what was formerly Borough Hall at 1 Monument Drive into 400 Witherspoon Street, freed up valuable square footage, making room for tenants sorely in need of new space. The non-profit counseling center Corner House and the local television channel TV 30 have moved from the beleaguered Valley Road School building to 1 Monument Drive. Princeton Community Housing is expected to relocate from its offices at 245 Nassau Street sometime this year, becoming the building’s third tenant. The television station moved in this week. Corner House, at the new location since May 14, held an Open House last week to show off it’s new digs. What was formerly Princeton Borough’s engineering, fire inspection and sewer offices on the lower floor of the building is now a sleek series of offices, meeting rooms, and treatment areas. While the footprint is actually smaller than in the previous location, it is more practical, usable, and professional. The new headquarters has a sound-masking system that prevents clients and those helping them from being overheard in the hallways. There are state-of-the-art training rooms with one-way mirrors. 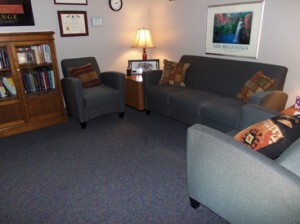 The clinical director can supervise both rooms from his office. These replace an antiquated system in the old building that used an old video camera mounted on the wall. KSS Architects assisted in the refitting process. While the basic outline of the walls on the lower floor stayed the same, there was some construction involved. “It’s funny, because this was the least costly model we had talked about, and it’s the most effective,” Mr. Bruschi said. The non-profit Corner House provides counseling for young adults, adolescents, and their families on substance abuse and other issues. The organization was established in 1972 and was originally housed at Henry and Witherspoon streets before moving to the Valley Road School building at 369 Witherspoon Street.